A vacation to a tropical island simply isn’t complete without an adventure out on the water. And when you’re booking a stay at a destination like the Mai Dive Astrolabe Reef Resort on Fiji’s Ono Island, you’ll want to take advantage of exploring one of the world’s most renowned coral reefs. 2 of the best ways is enjoy the warm waters of the Kadavu Archipelago is to snorkel or scuba dive. If you’ve spent any time planning a trip to warmer climates, you’ve undoubtedly heard and read about snorkeling and scuba diving a lot — sometimes interchangeably. So what is the difference between snorkeling and scuba diving, and which activity is best for you? Snorkeling is simply swimming along the surface of the water and looking down at the oceanic activity below you. No special skills or training is required, and the equipment needed to do it is minimal. Scuba, or SCUBA, is an acronym for Self Contained Underwater Breathing Apparatus, which is the pressurized air tank you need to wear as you dive well below the surface. It’s what allows you to be fully immersed (both literally and figuratively) in the ocean life around you. It’s a more extreme experience, and as such, more training and equipment are necessary. Which is right for your next tropical vacation: snorkeling or scuba diving? Let’s take a look at some of the bigger differences between these two activities. One of the key differences between snorkeling and scuba diving is the amount of preparation you’ll need to undertake before getting in the water. Snorkeling doesn’t require any training. If you are able to swim you’ll be able to enjoy the activity by simply slipping on your snorkeling gear and entering the water. Someone who has never snorkeled before can be a pro within minutes. More advanced swimmers can dive down a little ways while snorkeling, but they can stay underwater only as long as they can hold their breath. Scuba diving, on the other hand, requires much more training before you jump in. Since you’ll be well below the surface of the water, you’ll need to learn how to breathe properly using a tank and tube, and you’ll want to know about all the safety precautions one should take during a dive. 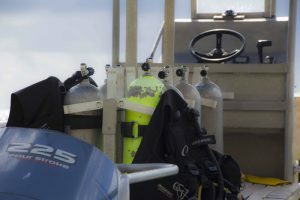 These training programs are often extensive and many resorts and excursion hosts require training before embarking on a scuba diving excursion. Because of the necessary training, the investment of time and money is much greater for those who want to learn how to scuba dive, but many believe the payoff is greater as well. At Mai Dive, SCUBA training courses are available, such as the PADI Discover Scuba Diving (DSD) course, one of the world’s most popular scuba courses to try Scuba Diving for the forst time. 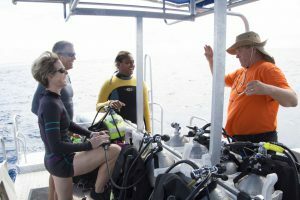 In just one session we cand teach you the basic skills and you dive with a PADI professional for your first dive right out the front on our extensive house Reef. If you and the PADI Professional think you are comfortable enough after your 1st DSD we can take you out on the boat and show you some of the other sites as well. Each activity requires different equipment. For scuba diving, the primary piece of equipment you’ll need is a pressurized gas tank with a tube. This tank will be your air supply while you’re underwater. A wetsuit is also necessary to keep your body temperature regulated, even in tropical waters. Foot fins will help you through the water, propelling your movement. And lastly, if you are not an experienced diver, you’ll want a guide to accompany you. At Mai Dive, we make sure your scuba diving in Fiji experience is as safe and enjoyable as it is unforgettable. We create daily dive plans tailored to the requirements of our diving and snorkeling guests that factor in your experience level, the tides, the water conditions and the weather. Snorkeling requires much less equipment; a mask that allows you to see the wonders of the underwater world, and a snorkeling breathing tube, typically 16 inches long, that allows you to submerge your face in the water while still being able to access the air above. Some snorkelers may want to use foot fins as well to move faster and with less effort on the surface. Both snorkeling and scuba diving masks can be made up of a single lens or multiple lenses, and the latter can even be made to accommodate divers and snorkelers who need vision correction. The Great Astrolabe Reef is, at more than 60 miles long, one of the largest and most magnificent barrier reefs on the planet. It surrounds several of Fiji’s islands, including Ono Island, and the warmth and clarity of the water brings out the vivid colors of the majestic underwater world. In fact, on calm days, visibility can be as great as 100 feet or more, allowing both snorkelers and scuba divers the chance to see vast displays of ocean life in every direction. Specifically, you’ll see a tremendous variety of fish species, including marlins, snappers, and even manta rays. Scuba divers will be able to get up close and personal with amazing hard and soft coral formations, and more advanced divers will want to explore the submerged pinnacles and slopes covered with coral. (Of course, less experienced divers will still be able to take it all in without any trouble.) No matter your skill level in the water, whether you go in with a tank or with just a snorkel, the incredible sights of the Great Astrolabe Reef will stay with you for the rest of your life. Skim the Surface — Or Dive In!